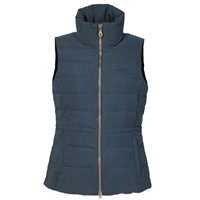 The Musto Quilted Coaching Gilet is perfect for the colder time of year. With a polyester outer shell, nylon lining and duck down fill you can be sure you will have the warmth you crave through the bitter months. Adding to the warmth is a high insulating snug collar which also brings comfort and protection. An internal shock cord waist adjuster allows you to get the flattering fit you want. Keeping your valuables secure couldn't be easier with lower pockets with press stud closure and an internal security pocket. Musto brand the gilet with their iconic logo embroidered to the chest.